What could be luckier than a four-leaf clover formed out of horseshoes? An 18ct gold one of course. Perfect for bringing you good fortune on a day at the races, Links of London’s Ascot Lucky Clover Horseshoe necklace gives a stylish nod to these symbols of luck with its symmetrical gold charm. Luck has nothing to do with the carefully combined Oud de Nil Eau de Parfum fragrance from Penhaligon’s. The complex and uplifting scent starts with clean and crisp top notes of bergamot and grapefruit, developing into a floral bouquet of rose, jasmine and geranium, before ending on a woodsy, warm base note with amber, papyrus and agarwood, taking you from spring to summer to autumn in one breath. The versatile Equateur silk scarf from Hermes can also take you through the seasons. With a washed finish giving a relaxed, mattified and ever so slightly faded look, the scarf features toucans, parrots and monkeys surrounding the regal jaguar as a centrepiece. But back to spring, and the most important event of the season, Easter. 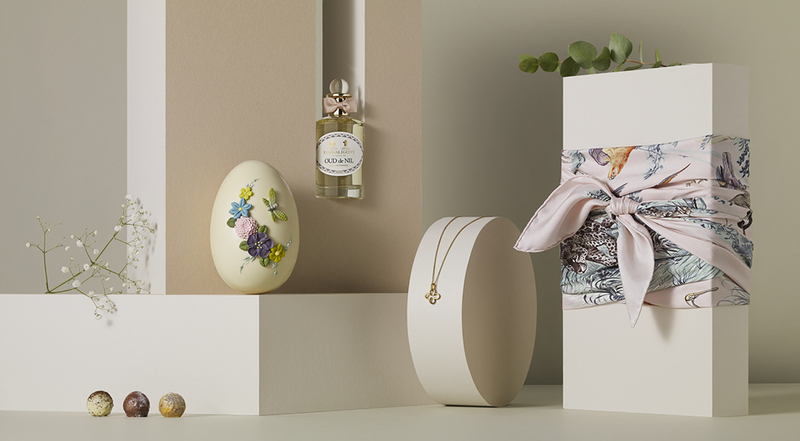 The beautifully decorated white chocolate Easter egg from Fortnum & Mason conceals a delicious surprise inside its pretty exterior. If you can bear to break open the handmade shell covered with intricate sugar flowers, you’ll discover a selection of white chocolate shapes inside. Finally, and staying in the chocolate department (it’s Easter after all), there are few chocolatiers as adventurous and innovative as Paul A. Young, and his ever-changing, ever-growing selection of fine chocolates is sure to delight and enthral, with mouthwatering varieties including Peanut Butter & Raspberry Jelly, and Bucks Fizz to name but two. All these Easter treats and many more are available at The Royal Exchange.